The art of building dry stone walling is an ancient one, with the earliest record of a wall in the Lake District dating from the thirteenth century, when Cistercian monks at Furness Abbey were granted the right to enclose an area of their land in upper Eskdale with a dyke, wall or paling, as the abbot and monks should think most convenient to them. During the following centuries the building of dry stone walling around farms and villages must have been commonplace, although by the end of the eighteenth century the proportion of land enclosed by dry stone walling would still have been comparatively small. The rest was common land over which local inhabitants had certain rights. The enclosure movement, mainly concentrated in the sixty years between 1760 and 1820, and relying upon Act of Parliament to enforce enclosure and extinguish rights over this common land, has been described as one of the most notable developments in English agriculture. 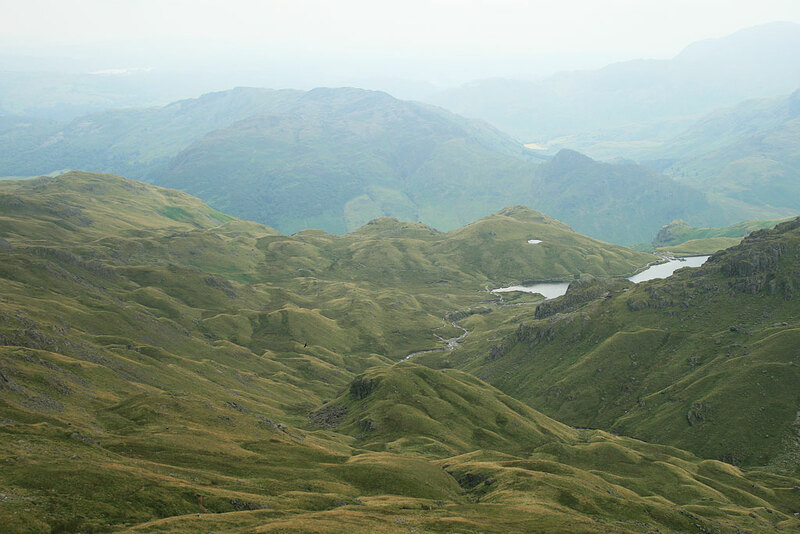 Enclosure in the Lake District and Cumbria took place mainly after the General Enclosure Act of 1801. The long straight dry stone walling of the fells, easily distinguished from the irregular boundaries of the valley fields, were the product of this movement. In the main, the pattern of dry stone walling in the Lake District and Cumbria was established by about the middle of the nineteenth century. The life of the dry stone walling builder in the cold, wet and windy conditions of the Lakeland fells could not have been an easy one. To provide secure foundations, the line of the dry stone walling would be marked by a shallow trench in which two parallel rows of large and usually square stones (footings) were set. Further courses would be placed on to these so that, in effect, two walls were being built, bound together by occasional rows of ‘through’ stones, which were often left projecting on each side of the dry stone walling. Each course of stones would be carefully placed so that it was slightly inset relative to the below, thus the width of the dry stone walling gradually decreased, this ‘batter’ adding considerably to the dry stone walling stability. The resulting gap in the middle was filled by a rubble of small stones, called the hearting and the top was completed by a single row of flat stones (coping stones)with the weight down, placed on edge and thus holding the wall stones down. .
No mortar whatsoever was used in the construction of dry stone walling, hence its name. The product was essentially a balanced structure depending entirely for its durability upon the craft of the men who built it. The stone for dry stone walling was collected on the fellside around the site or, if necessary, from a local quarry. The walls of the Lake District and Cumbria therefore show differences in the type of stone used as well as in the individual style of the dry stone wallers themselves. All courses start at 9:30am and run until 4:30pm and are held in the Ullswater Lake area. 1 day at weekends or on weekdays throughout the year. Our beginners’ course aims to show you how to correctly rebuild a straight forward section of dry stone wall. You will participate in every stage of its construction from stripping out an old wall in the morning to finally placing the coping stones six or seven hours later. You will also learn how to erect a batter frame, set your guide strings and correctly cut stone using a brick hammer. Lunch is included in the course fees. Commence in April 2012 with dates coming soon. Price : £55 per person. Apply to join course by completing our contact page form. We look forward to seeing you on our next dry stone walling course.